Now the business has been handed down to his son Danny who has since expanded to three outlets in Ipoh; the first being a double shoplot in Taman Ipoh Jaya near Gunung Rapat, the second is in Bandar Baru Medan, Ipoh and the most recent addition is SYW situated on Jalan Mustapha al-Bakri, directly opposite the famous kaya puff shop named Sin Eng Heong. The first two outlets (both named Sun Yeong Wai) replicated more or less the same concept of a casual dining experience; most dishes are pre-cooked and displayed behind the glass counter, while you choose your preferred barbecued meats (duck, chicken, barbecued pork or char siew, roasted pork or siew yoke) as the highlight of the meal. 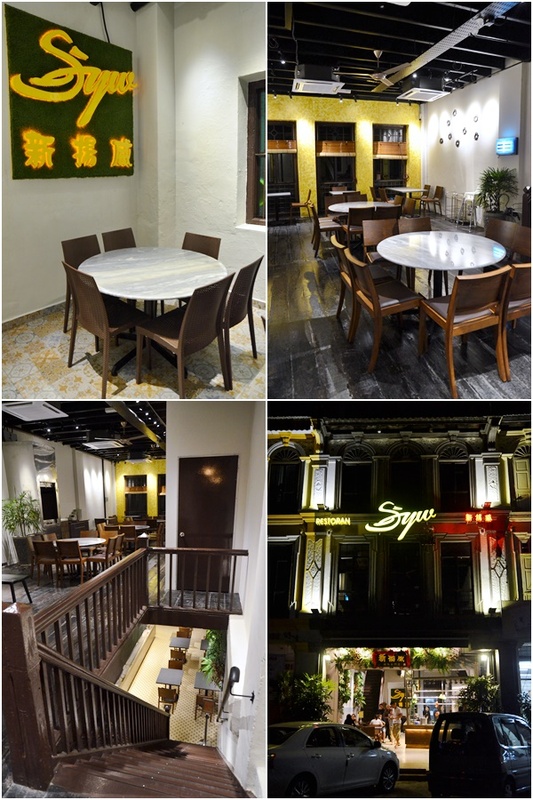 The third and latest branch named SYW resembles a proper sit-down restaurant with laminated menus, some cooked-to-order dishes, and a few more creative ideas to differentiate them from the competitors; claypot duck porridge, boiled duck meat salad and even mini smoked duck burgers (coming soon). 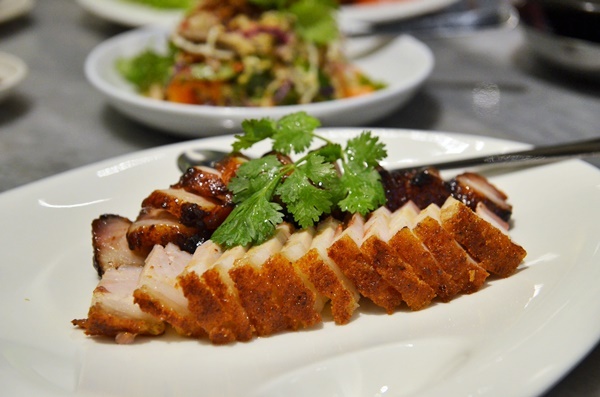 The safer choices are still there — their signature roast duck, pei pa duck and smoked duck are all still available while roast chicken, char siew and siew yoke complete the ensemble. We started with a bowl of bitter gourd and salted vegetable soup (MYR3.50), a warm and comforting combination that calmed the stomach, and a serving of the highly recommended boiled duck meat salad (RM10.90). 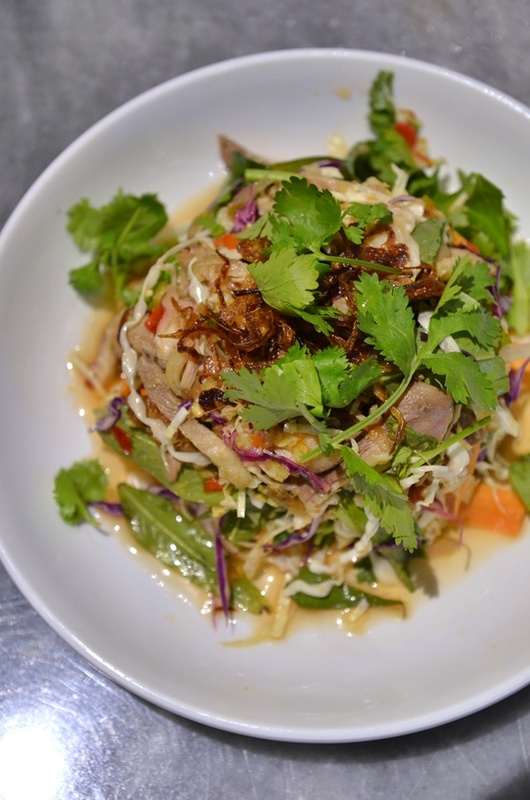 The salad was indeed deeply satisfying; the thinly-sliced duck meat flavoured with a tangy dressing, the medley of cabbage (both red and white), carrots, cilantro and fried shallots rendered the appetizer with complex flavours and a crisp texture. The platter of roast pork and barbecued caramelized pork RM12-28, depending on portion size) featured both meats cut to about half an inch thick; perfect for a bite-size experience yet not too tiny to slip off a pair of chopsticks. The roast pork fared slightly better in this case, the crunchy skin cracked with every bite — complementing the marinated meat and a layer of fat wedged between them really well. The accompanying chilli sauce did its job while not being overpowering or underwhelming. The char siew, meanwhile, was a little too fat for my liking; losing the advantage in a way to some competitors who seem to do better in giving us a smoky, sweet and caramelized taste with a firm bite of tender pork belly. Salvation came almost immediately in the form of a half roast duck (MYR29); easily amongst the best that one can find in Ipoh. Well, close challengers would be the one that used to be in Canning Garden (next to the field but now has ceased operations), the one along Jelapang main road, or even the one in Falim on the way to the Lumut Expressway. SYW’s version focuses more on the robust (you might say gamey, but it’s certainly well within the bearable radar) original flavours of the duck; roasted whole and in such a manner to retain the juices of the fowl within while the skin is gradually browned and attains a certain gratifying crisp texture. 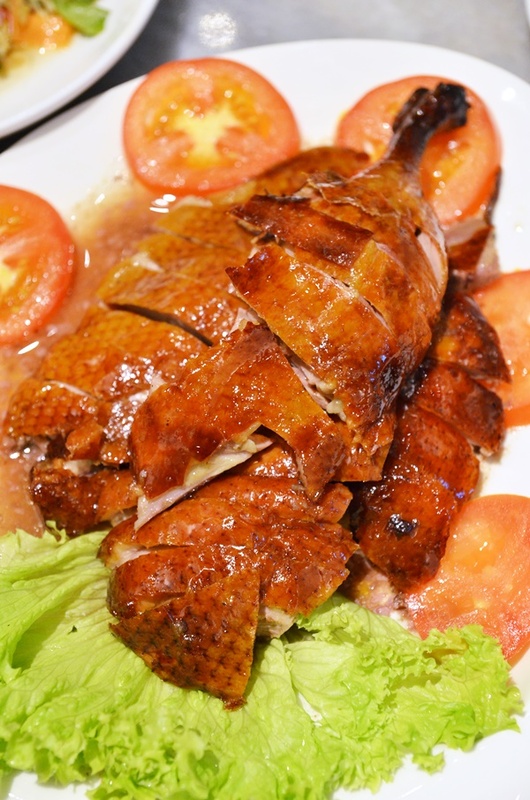 Unlike the Pei Pa duck (which they also sell but ran out of that evening) which is roasted in a butterfly position; the signature roast duck is less crispy but the meat is more tender and juicy; so it is a compromise dependent on your preference. Another delightful invention of theirs — the smoked duck — was not available yet at this new outlet, but should be coming really soon. 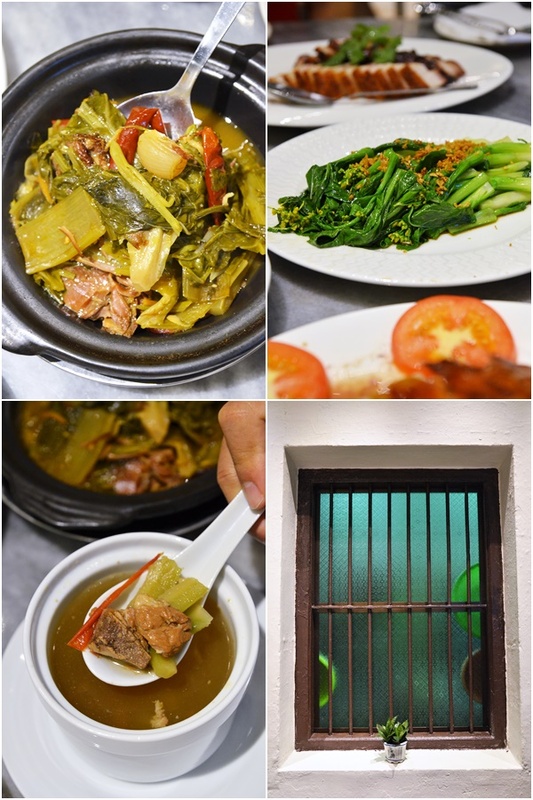 Some of their dishes are served in claypots; a mode of serving that appears to do better in terms of retaining the warmth of a dish and is thus suited for dishes like the claypot duck porridge (RM8), claypot ginger duck, claypot grouper fish, and even claypot sour and spicy vegetables (RM6) which is a staple usually served as a side dish at most chicken rice stalls. The three-storey establishment certainly holds a lot of promise; fully air-conditioned and fashioned to mimic a classic Chinese eatery yet exuding a cool aura that does not feel out of place despite the feast that they serve. The location is fairly strategic; within the tourist hotspot near to Lou Wong bean sprout chicken in Ipoh and somehow does not have direct competition (yet) within the vicinity. 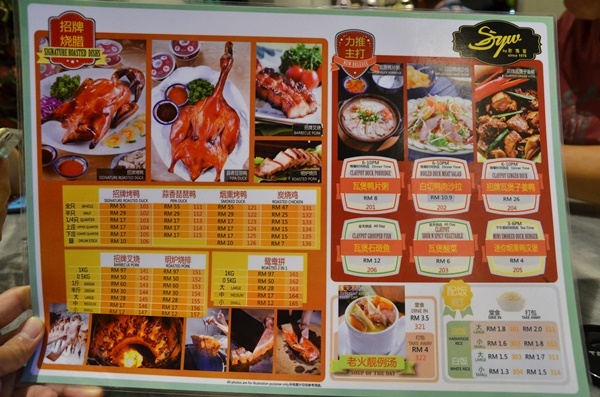 *SYW is located directly opposite of Sin Eng Heong kaya puff, and near to Lou Wong/Onn Kee. Talking about roast ducks. Thge famous Old Friends in Chemor has spawned a New Old Friends in Kuala Kuang by his disciple and the latter has started a stall in Gunong Rapat. Keen Seng Coffeeshop opposite Gunong Rapat Market, next to Magnum 4D shop. Please try it. In my opinion, it beats ALL the roast ducks in Ipoh.